Adelaide’s latest craft brewer launches its first cans; art meets coffee at the new La Boheme Coffee House in Grote Street; stout meets whisky in a Pirate Life collaboration, and gin is flavour of the month at rooftop bar Hennessy. The first release of Shapeshifter beers. New Adelaide craft brewer Shapeshifter Brewing Co is having its official launch party at the Wheatsheaf Hotel tonight but craft beer lovers may already have spotted its distinctive cans with the wolf logo at a few local retailers in recent weeks. “Being a contract brewer it can be hard to make an impact in the market if you launch with just one beer, so we decided to go for four – so far we’ve had a great response,” says Shapeshifter brewer James McCall. Its four beers range from a 3.5% Session Ale to a 6.6% double-dry-hopped Hazy IPA, and also include a New World Pilsner and a Pale Ale made with Idaho 7 hops. The latter is the first of a planned series of single-hop pales ales McCall says will help give the brewery “a good point of difference” in what is becoming an increasingly crowded market. Mashing in for the inaugural brew: Shapeshifter’s James McCall. Shapeshifter’s launch has been two years in the planning and has its origins in the friendship forged between owners James McCall (a graphic designer) and Kevin Mulcahy (who has a background in small business), who met while studying microbrewing at TAFE in Regency Park in 2016 and decided their complementary skills would be ideal for a joint business. “I’ve been homebrewing for about seven years,” says McCall, who had completed two previous microbrewing courses at TAFE in 2013 and 2014. The business name was inspired by the idea that four ingredients can be transformed into many different-tasting beers through the brewing process, he says, adding that the wolf image on the cans is represents the Latin name for hops – humulus lupulus or “little wolf”. Shapeshifter’s first releases (800 litres of each beer) have been contract brewed at Sow & Piglets Brewery in Victoria (a decision influenced partly by its canning facilities), but down the track McCall and Mulcahy hope to move to a contract brewer in South Australia. “Longer term, we will be looking to set up our own taproom and brewery in Adelaide, hopefully relatively close to the city, where we can brew on site and have people come to our venue as well,” McCall says. In the meantime, keep an eye out for a Shapeshifter caravan popping up at events such as Fork on the Road and Beer & BBQ Festival. Brett Dowsett at La Boheme Coffee Shop. Grote Street cocktail bar and cabaret venue La Boheme has added a new dimension to its offering with the opening of the La Boheme Coffee House – a daytime venture selling coffee, tea, cold drinks and light breakfast, snacks and lunch options. The coffee house is being run by barista Brett Dowsett, who for the past two years has operated mobile coffee business Incognito Espresso. 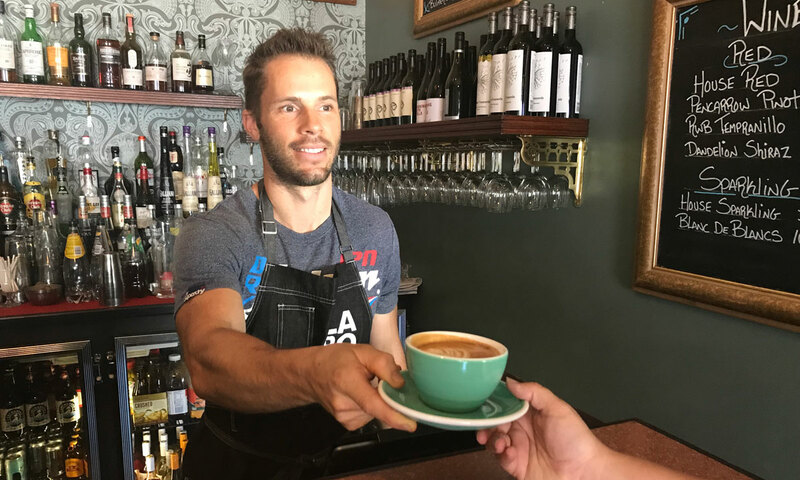 “This opportunity came up at La Boheme and I love the relaxed, European atmosphere of the place, while being able to develop a coffee shop in the heart of the city,” Dowsett says. La Boheme Coffee House is open from 6.30am to 3.30pm week days. In addition to Dowsett’s own Incognito Cold Brew, the daytime drinks menu will include Dawn Patrol coffee, Tea Catcher teas, cold brew ice-creams, shakes and affogatos. He also hopes to introduce breakfast events, including live performances on the La Boheme stage. Meanwhile, further along the road at 116 Grote Street, new performing arts venue Union Hall is also introducing coffee and food to its offering. Conductor and musician James Pratt, who recently took over the lease of the premises and is presenting a range of intimate classical music events, tells The Forager that as well as catering for performance guests, the café will be open to the public up until around midday or early afternoon, Monday to Friday, from February 11. It will serve coffee, smoothies, raw cakes and light food such as quiches and toasted sandwiches, with seating both inside and out. You can read more about Union Hall, which is in the historic building that previously housed live music venue The Promethean, in this earlier InDaily article. In further good news for beer lovers, Pirate Life will be at Hains & Co tomorrow night launching its latest release: a stout aged for 18 months in Limeburners American oak whisky barrels. The collaboration between WA’s Great Southern Distillery, which makes Limeburners whisky, and Pirate Life was set in motion when the former’s founder visited the Hindmarsh brewery. The beer spent 18 months in Limeburners barrels at the brewery, and was then brewed twice more. “Dark and thick in the glass the aroma has hints of chocolate, vanilla and a touch of coffee,” says Pirate Life’s website. It’s being launched with a limited release of 4800 bottles. As well as tastings of the new stout, tomorrow’s event at Hains & Co will also feature pairings of Pirate Life beers with Limeburners drams. Over at the Mayfair Hotel’s Hennessy Rooftop Bar, gin is the flavour of the month thanks to a collaboration with Adelaide Hills Distillery. For February only, the bar has expanded its “Ginspirations” menu with four new special drinks: 78 Degree – Finger Lime and Coastal Rosemary; Sunset Gin – Fresh Strawberry and Thyme; Green Ant Gin – Green Ants and Coastal Rosemary; and Negroni the AHD Way – a splash of 78 Degree Gin, bitter orange and Rosso Vermouth. 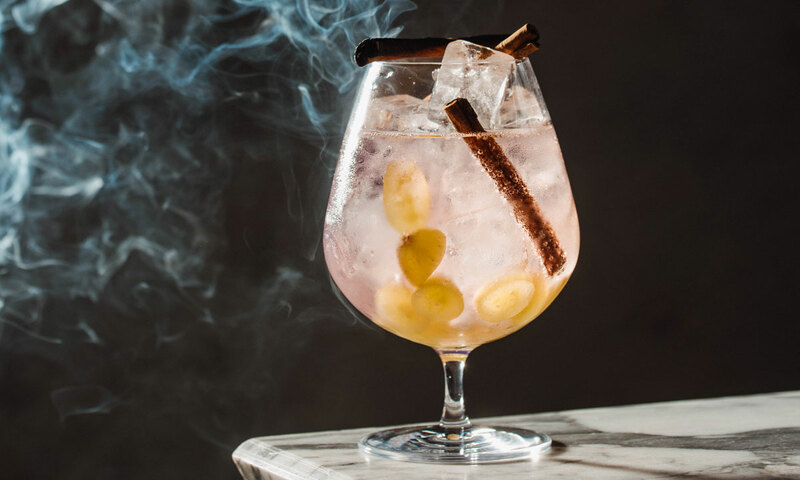 It will also be serving the smoking thirst-quencher you see above, 78 Degree with Grape & Burnt Cinnamon, a regular item on the drinks menu.